The essay and photo contests are now closed. We wish to thank all those who submitted entries! Winners will be announced 30 September 2011. 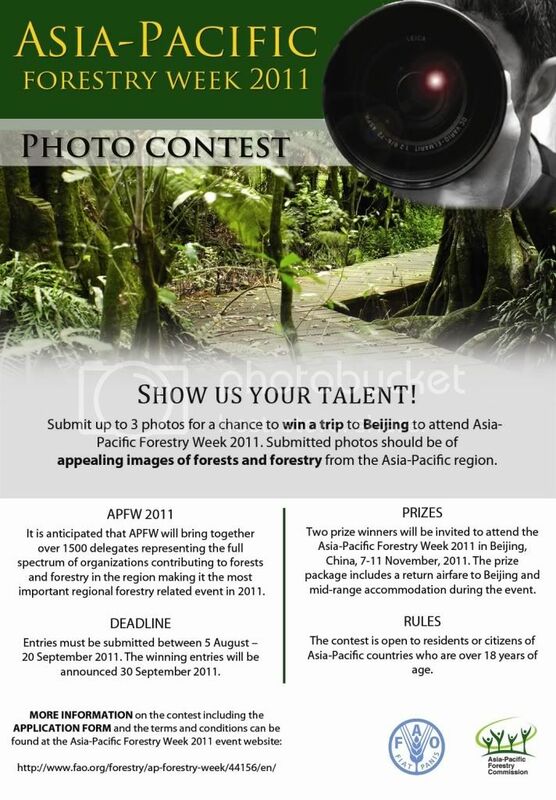 Two outstanding forestry practitioners will be selected as "Champions of Asia-Pacific Forests" and costs related to participating in the APFW 2011 will be covered. The includes a return airfare to Beijing and mid-range accommodation. Nomines must be nationals of an Asia-Pacific Forestry Commission member country. Click here for more information on this Award and here to complete a Nomimation form. The deadline for submission is 7 October 2011. Entrants may submit up to 3 photos (maximum 5MB) of appealing images of forests and forestry from the Asia-Pacific region. The contest is open to all residents and citizens of Asia-Pacific countries over 18 years of age. Download the photo contest Terms and Conditions and Application Form to learn more about contest rules and submitting photos. Click on the flyer below to download for contest distribution and promotion. The deadline for submission was 20 September 2011. The winning essays will be read for the first time during APFW 2011 in Beijing.